To the organic network of fans who swap bootlegs of their live shows over the Internet, and who purchased more than 40,000 copies of their four independent releases, the term Waterdeep has become more an adjective describing a grassroots phenomenon than it has a band name. Logging more time on the road every year than they do in their hometown of Wichita, Kansas, the members of Squint Entertainment's latest signing have witnessed the growth of a far-flung but close-knit community centering not so much around them as a band, as around the ideas and passions that drive and shape them. While the music on their label debut 'EVERYONE'S BEAUTIFUL' marks a compelling union of rock, worship and acoustic pop, Waterdeep's truest distinction is evidenced by the relationships that spring up in every town they visit. Most Waterdeep concerts have an aura about them that feels something like the intimacy of a casual evening with friends crossed with the dedicated enthusiasm of a trekkie convention. Even from the stage Waterdeep is all about dialogue, relatability, connectivity, and a shared experience with the people who have come to see them. "What people see on stage," says keyboardist Christena Graves, whose husband Brandon also plays drums for the band, "is what they're going to see after we're done playing, too." Part of what makes the atmosphere around Waterdeep so chemical is their willingness to create "in the moment." The five piece band is known for taking chances, for improvising on the fly, for sailing out into uncertain seas, and somehow finding their way back to dry land. Tapes of their live shows are a hotly collected item because of the fluid approach they take to their music; songs are seldom performed the same way twice, and completely new musical exchanges are generated spontaneously as they go. This gives the music a living, breathing, rooted feel, with very little pretense and a welcoming vulnerability, especially when their voices and instruments begin to brood and soar in a creative act of worship. There's a pregnant sense that anything could happen. 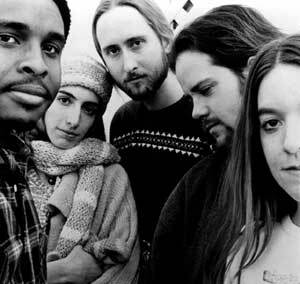 "The history of Waterdeep is all about the live show," observes bassist Kenny Carter. "We've come to realize that God most often works through people in relationship, in community, with one another," says Don Chaffer, who shares guitar and vocal duties with his wife Lori. "What some people refer to as the 'Waterdeep community' is really just a microcosm of the Body of Christ. These people aren't just showing up to watch a performance. It's the community, the fellowship, the worship that's central." "We've found community with pockets of people all over the country," says Brandon. "Almost everywhere we go we find fellowship and experience what the Body of Christ is. We've found family and friendship with a lot of people who aren't even acquainted with everything we do, but who care more about our souls than they do about our musical gifts. Being able to interact in the way we do with so many people takes the focus off being a rock-n-roll band and puts it on building relationships. That's how this whole 'Waterdeep community' got started." "We see it as something God has done so that we don't get dried up on the road," says Lori. "Being open to friendships on the road has helped us maintain our humanity and our sanity." The emphasis on human community for divine purpose is frequently evidenced in Waterdeep's songs by way of a recurrent compassion. Empathetic portraits of the brokenness of individual lives are painted in the lyrics that Don and Lori pen, infused with the hope of a Christ who enters into that brokenness in order that he might redeem it. Songs like Walls and Tall Shadows, Go Find John , Sweet River Roll and the title track Everyone's Beautiful each reflect the idea of a pursuing God extending hope, healing and forgiveness to those who desperately need it. "Our need for God is revealed in our brokenness," Don explains, "whether it's physical, spiritual, emotional or whatever. Life can knock people to their hands and knees and be very humbling and painful. And yet it's in those times when we're on our hands and knees that we're most likely to realize our need for God and to crawl towards him." "Having someone acknowledge the truth that life can be painful sometimes, but then saying 'There's a beautiful end to the story if you can just hang on and believe,' that's what speaks to the heart of humans and human experience," interjects Kenny. "There is suffering and disappointment in every life, but there is redemption for all of it. Acknowledging that brokenness and embracing that redemption is a big part of what we're about." Several of the songs on EVERYONE'S BEAUTIFUL, such as the instantly memorable "He Will Come," and the bright, celebrative Van Morrison cover "Whenever God Shines His Light," deal with that recognition that human identities should be "found in God and his acceptance of us, rather than in our ability to measure up to the standards of the world." EVERYONE'S BEAUTIFUL features the production team of Darrell Brown (Russ Taff, Radney Foster) and Dennis Matkosky (Chicago, Wilshire). Don co-produced the album, which was engineered and mixed by Niko Bolas (Neil Young, Fiona Apple, Billy Joel). Making a concerted effort to obtain the feel of Waterdeep's live show, the producers nurtured a warm analog mood for the recording. Says Don, "Of all the albums we've made, EVERYONE'S BEAUTIFUL feels like the most successful at capturing the personality of the band." Sensing their own need to remain rooted and grounded amidst the pressures of artistry, ministry and life on the road, the members of Waterdeep gratefully accepted a recent invitation to join with a Wichita pastor and church in pioneering a support model for artists in ministry. Sent out now from their home church as missionaries, Waterdeep enjoy a broad base of support, including a financial advisory board, regular and intensive debriefing sessions with their pastor, and an intercessory prayer team that prays for them while they're on the road. When asked about Waterdeep's mission statement, Don responds, "We want to be a part of a community of people that leads our generation into a deeper relationship with God; a community that is pushing forth the Kingdom of God, and specifically one that recognizes the arts as a viable way to do that. With that support as our platform, we want to speak eternal Truth into a culture that has seen the dissolution of truth. We want to present the bad news and the good news. All people are sinners in need of healing and forgiveness, and that need has already been met completely through Christ."